There will be only one (last) round of the Regular Season in PBA. Here is the last round review presented by ESL. The most important game in the last round took place in Pasig between third ranked TNT Ka Tropa (7-4) and eleventh ranked Global Port (3-6) on Sunday night. TNT Ka Tropa was crushed by Global Port on the road 83-109. It ended at the same time the five-game winning streak of TNT Ka Tropa. Global Port forced 19 TNT Ka Tropa turnovers and had a 39-26 advantage in offensive rebounds. They looked well-organized offensively handing out 23 assists. 28 personal fouls committed by TNT Ka Tropa helped opponents get some easy free throw opportunities. Naturalized American point guard Stanley Pringle (184-87, college: Penn St., agency: Pensack Sports) orchestrated the victory by scoring 27 points and 9 rebounds. Guard Robert Bolick (185-95) contributed with 8 points, 12 rebounds and 7 assists for the winners. Guard Celedonio Trollano (191-92) replied with 15 points and 7 rebounds for TNT Ka Tropa. The winner was already known earlier in the game, so both coaches allowed to play the bench players saving starting five for next games. Global Port moved-up to tenth place. TNT Ka Tropa at the other side keeps the third position with four games lost. They share it with SM Beermen. Global Port are looking forward to face higher ranked Alaska Aces (#8) in Makati in the next round and it may be quite challenging game. TNT Ka Tropa will have a break next round. The game in Makati City was also worth to mention about. Fifth ranked Ginebra Kings (6-3) played at the court of 7th ranked NLEX RW (4-6). Ginebra Kings managed to secure a 9-point victory 105-96. It ended at the same time the two-game winning streak of NLEX RW. Worth to mention a great performance of center Japeth Aguilar (206-87, college: W.Kentucky) who helped to win the game recording 27 points and 9 rebounds and Earl-Scottie Thompson who added 14 points, 8 rebounds, 8 assists and 4 steals during the contest. 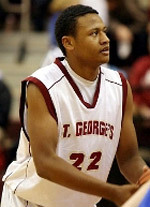 JR Quinahan (198-84) responded with 15 points, 7 rebounds and 6 assists. Both coaches used bench players which allowed the starters a little rest for the next games. Ginebra Kings have a solid three-game winning streak. They maintain fifth position with 6-3 record. NLEX RW at the other side keeps the seventh place with six games lost. They share the position with Alaska Aces. Ginebra Kings' supporters look forward to an exciting derby game next round, where their team will face at home their local rival from Manila Meralco Bolts. A very close game took place in Makati between TNT Ka Tropa and Columbian Dyip. Third ranked TNT Ka Tropa (7-4) got a very close home victory over 9th ranked Columbian Dyip (4-7). TNT Ka Tropa managed to escape with a 3-point win 101-98 on Friday evening. Host team only slightly avoided a big embarassment. The winners were led by Jayson Castro-William who scored that evening 20 points and 7 assists. Even 22 points, 9 rebounds and 5 assists by Jaymar Perez did not help to save the game for Columbian Dyip. Both coaches tested many bench players in such tough game. TNT Ka Tropa have an impressive five-game winning streak. They maintain third position with 7-4 record having just two points less than leader Phoenix, which they share with SM Beermen. Loser Columbian Dyip keeps the ninth place with seven games lost. There were no big surprises in other games of round 8: Global Port were beaten by Hotshots on the road 103-90. SM Beermen won against Alaska Aces on its own court 114-96. Hotshots managed to outperform Blackwater Elite in Pasig City 97-87. Alaska Aces managed to beat Meralco Bolts at home 92-77. The most impressive performance of 8th round was 10 points, 6 rebounds, 14 assists and 4 steals by Chris Ross of SM Beermen. A very close game took place in Makati between TNT Ka Tropa and Columbian Dyip. Third ranked TNT Ka Tropa (7-4) got a very close home victory over 9th ranked Columbian Dyip (4-7). TNT Ka Tropa managed to escape with a 3-point win 101-98 on Friday evening. Host team only slightly avoided a big embarassment. TNT Ka Tropa forced 27 Columbian Dyip turnovers. They looked well-organized offensively handing out 30 assists comparing to just 16 passes made by Columbian Dyip's players. The winners were led by point guard Jayson Castro-William (180-86) who scored that evening 20 points and 7 assists and forward Kelly Williams (201-82, college: Oakland) supported him with 12 points, 9 rebounds, 6 assists and 4 steals. Even 22 points, 9 rebounds and 5 assists by guard Jaymar Perez (188-93) did not help to save the game for Columbian Dyip. American guard Rashawn McCarthy (185-89, college: Old Westbury) added 17 points, 8 rebounds and 4 assists (was perfect 7-for-7 from the free throw line) for the guests. Both teams had five players each who scored in double figures. Both coaches tested many bench players in such tough game. TNT Ka Tropa have an impressive five-game winning streak. They maintain third position with 7-4 record having just two points less than leader Phoenix, which they share with SM Beermen. Loser Columbian Dyip keeps the ninth place with seven games lost. No shocking result in a game when seventh ranked Hotshots (5-5) beat 11th ranked Global Port (3-6) in Pasig City 103-90 on Wednesday. Hotshots forced 25 Global Port turnovers. They looked well-organized offensively handing out 22 assists. Great defensive blocking was one of the keys in this match when Hotshots made 7 blocks. The winners were led by guard Paul Lee (185-89) who scored that evening 24 points and 4 assists and power forward Ian-Paul Sangalang (201-91) supported him with 20 points. Even a double-double of 19 points, 16 rebounds and 4 assists by naturalized Tongan center Moala Tautuaa (200-89, college: Chadron St.) did not help to save the game for Global Port. Naturalized American forward Sean Anthony (193-86) added 22 points and 8 rebounds for the guests. Five Hotshots and four Global Port players scored in double figures. Both coaches allowed to play bench players saving starting five for next games. Hotshots moved-up to sixth place. Global Port lost sixth consecutive game. They dropped to the tenth position with six games lost. Hotshots will meet at home NLEX RW (#7) in the next round. Global Port will play against Alaska Aces in Makati and it may be a tough game between close rivals. The most important game in the last round took place in Pasig between third ranked TNT Ka Tropa (7-4) and eleventh ranked Global Port (3-6) on Sunday night. TNT Ka Tropa was crushed by Global Port on the road 83-109. It ended at the same time the five-game winning streak of TNT Ka Tropa. Global Port forced 19 TNT Ka Tropa turnovers and had a 39-26 advantage in offensive rebounds. They looked well-organized offensively handing out 23 assists. 28 personal fouls committed by TNT Ka Tropa helped opponents get some easy free throw opportunities. Naturalized American point guard Stanley Pringle (184-87, college: Penn St., agency: Pensack Sports) orchestrated the victory by scoring 27 points and 9 rebounds. Guard Robert Bolick (185-95) contributed with 8 points, 12 rebounds and 7 assists for the winners. Four Global Port players scored in double figures. Guard Celedonio Trollano (191-92) replied with 15 points and 7 rebounds and point guard Jayson Castro-William (180-86) added 7 points, 5 rebounds and 7 assists in the effort for TNT Ka Tropa. The winner was already known earlier in the game, so both coaches allowed to play the bench players saving starting five for next games. Global Port moved-up to tenth place. TNT Ka Tropa at the other side keeps the third position with four games lost. They share it with SM Beermen. Global Port are looking forward to face higher ranked Alaska Aces (#8) in Makati in the next round and it may be quite challenging game. TNT Ka Tropa will have a break next round. Rather expected game when 7th ranked Alaska Aces (4-6) lost to fifth ranked SM Beermen (7-4) in Manila 96-114 on Sunday. SM Beermen looked well-organized offensively handing out 25 assists. Great defensive blocking was one of the keys in this match when SM Beermen made 8 blocks. The winners were led by naturalized American guard Alex Cabagnot (183-82, college: Hawaii-Hilo) who scored that evening 31 points and naturalized German forward Christian Standhardinger (206-89, college: Hawaii) supported him with 23 points and 7 rebounds. Even 22 points and 5 assists by point guard Christopher Banchero (186-90, college: Seattle Pacific) did not help to save the game for Alaska Aces. Guard Jeron-Alvin Teng (190-94) added 11 points, 10 rebounds and 4 assists for the guests. Both teams had five players each who scored in double figures. Both coaches allowed to play bench players saving starting five for next games. SM Beermen moved-up to third place, which they share with TNT Ka Tropa. Loser Alaska Aces keep the seventh position with six games lost. They share it with NLEX RW. SM Beermen will have a break next round, and it should allow them to practice more before next game. Alaska Aces will play against Global Port (#10) and hope to secure a win. Very predictable result when seventh ranked Hotshots (5-5) won against bottom-ranked Blackwater Elite (2-9) in Caloocan City 97-87 on Friday. Hotshots outrebounded Blackwater Elite 52-38 including 20 on the offensive glass. They looked well-organized offensively handing out 24 assists. The winners were led by power forward Ian-Paul Sangalang (201-91) who had that evening a double-double by scoring 16 points, 10 rebounds and 5 assists and guard Paul Lee (185-89) supported him with 16 points, 9 rebounds and 4 assists (was perfect 8-for-8 from the free throw line). Five Hotshots players scored in double figures. 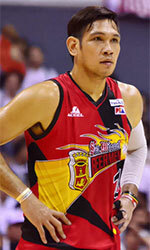 Even 16 points and 6 rebounds by forward Rey-Mark Belo (191-93) did not help to save the game for Blackwater Elite. Forward Allein Malicsi (190-87) added 16 points for the hosts. Both coaches allowed to play bench players saving starting five for next games. Hotshots moved-up to sixth place. Blackwater Elite lost third consecutive game. They stay at the bottom position with nine games lost. Hotshots will meet at home NLEX RW (#7) in the next round. Blackwater Elite will have a break next round. Everything could happen in Makati at the game between two tied teams. Both seventh ranked Alaska Aces and 10th ranked Meralco Bolts had identical 3-6 record. This time Alaska Aces used a home court advantage and beat the opponent from Manila 92-77 on Wednesday night. The winners were led by point guard Christopher Banchero (186-90, college: Seattle Pacific) who had that evening a double-double by scoring 13 points and 11 rebounds and guard Jeron-Alvin Teng (190-94) supported him with 16 points and 7 rebounds (was perfect 7-for-7 from the free throw line). Four Alaska Aces players scored in double figures. Even 23 points and 8 rebounds by forward Nico Salva (191-90) did not help to save the game for Meralco Bolts. Forward Rommel Canaleta (198-82) added 18 points and 4 assists for the guests. Both coaches allowed to play bench players saving starting five for next games. Alaska Aces maintains seventh position with 4-6 record, which they share with NLEX RW. Loser Meralco Bolts dropped to the eleventh place with seven games lost. Alaska Aces will meet at home Global Port (#10) in the next round. Meralco Bolts' supporters look forward to an exciting derby game next round, where their team will travel locally in Manila to the arena Ginebra Kings. The game in Makati City was also worth to mention about. Fifth ranked Ginebra Kings (6-3) played at the court of 7th ranked NLEX RW (4-6). Ginebra Kings managed to secure a 9-point victory 105-96. It ended at the same time the two-game winning streak of NLEX RW. Ginebra Kings dominated down low during the game scoring 66 of its points in the paint compared to NLEX RW's 34. Ginebra Kings forced 22 NLEX RW turnovers. Their players were unselfish on offense dishing 27 assists. NLEX RW was plagued by 33 personal fouls down the stretch. Worth to mention a great performance of center Japeth Aguilar (206-87, college: W.Kentucky) who helped to win the game recording 27 points and 9 rebounds and guard Earl-Scottie Thompson (188-93) who added 14 points, 8 rebounds, 8 assists and 4 steals during the contest. JR Quinahan (198-84) responded with 15 points, 7 rebounds and 6 assists and power forward John-Paul Erram (203-89) scored 16 points and 8 rebounds. Five Ginebra Kings and four NLEX RW players scored in double figures. Both coaches used bench players which allowed the starters a little rest for the next games. Ginebra Kings have a solid three-game winning streak. They maintain fifth position with 6-3 record. NLEX RW at the other side keeps the seventh place with six games lost. They share the position with Alaska Aces. Ginebra Kings' supporters look forward to an exciting derby game next round, where their team will face at home their local rival from Manila Meralco Bolts.